will appreciate the nod to these influences in Northern Labor Party's music. Orange County and have appeared around various venues"
...Northern Labour Party... are among the many that we've loved." that could have been huge on KROQ's playlist during 1983." this Californian troupe is a gloom king waiting to be crowned. " and the likes of the post-punk movement. When it became time for the four souls to emerge from their individual prisons of isolation, they did so. When silent acceptance of pain became unacceptable, they stood up. When volunteers were solicited to combat the present musical era, they stepped forward. and new wave sounds, and proceeded forth with determination. and writing songs for what shall become their third release. to the musical frameworks developed by Magazine, Gary Numan, Joy Division, New Order, and Peter Murphy. 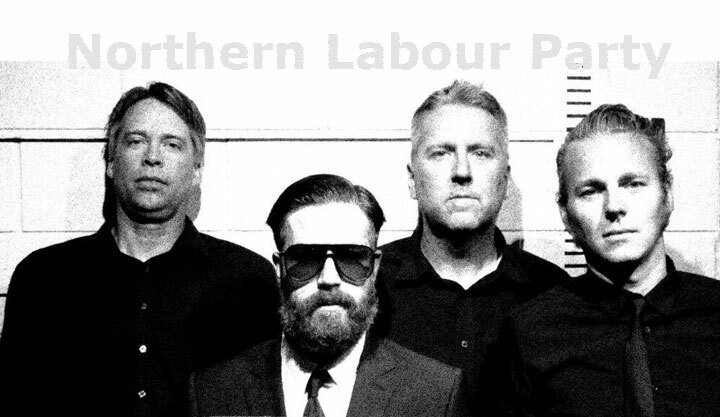 Northern Labour Party performances do not resemble a séance to the aforementioned bands' glorious pasts. However, their gigs do nod to the past, whilst looking to the future. Northern Labour Party is homed in Orange County, CA.